As long time readers will know, The Brooding Architect is my harshest food critic – particularly in respect to my baking. He comes from a long line of ‘baking purists’ and gets very anxious about my somewhat relaxed attitude towards baking, alleging that my unauthorised recipe modifications often result in ‘rock cakes’. 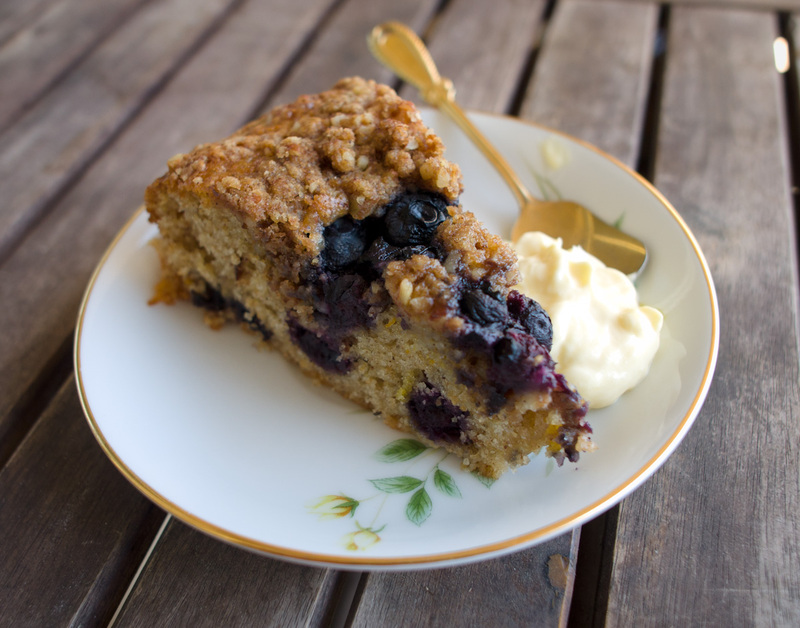 This month’s Delicious Magazine had a recipe for a very impressive looking blueberry crumble cake. Under strict instructions from The Brooding Architect I followed the recipe to the letter - no modifications, substitutes or shortcuts - and ended up with the your worst baking nightmare, a dry (rock) cake! In an effort to redeem myself (and prove The Brooding Architect wrong), I broke all of the baking rules and modified the original recipe; resulting in a deliciously moist, spicy and citrus-y Blueberry Crumble Cake. Perfect for afternoon tea, or after dinner with a cup of fancy tea. Preheat oven to 180 degrees Celsius. Grease and line a 24cm spring form cake pan. For the topping, place all of the crumble ingredients in a food processor and whizz for 1 – 2 minutes, until all of the ingredients are combined and the mixture resembles coarse breadcrumbs. Tip into a bowl and chill in the fridge while you prepare the cake batter. For the cake, in a separate mixing bowl, sift the plain flour, wholemeal flour and baking powder. Add the caster sugar. Make a well in the centre of the dry ingredients and add the olive oil, milk, orange juice, vanilla essence and zest. Stir until well combined and then gently fold in 200 grams of blueberries through the mixture. Spread mixture evenly in the cake pan, sprinkle the crumble mixture evenly over the top and press the remaining 100 grams of blueberries into the crumble. Bake for 50-55 minutes, until the crumble is golden brown and a skewer comes out clean. Cool in pan. Serve with a dollop of cream and a cup of tea. Hi I made this delicious cake today from your recipe above.. The list of ingredients.. Mentioned however in the method.